The body plates of my guitar were made by gluing the edges of two smaller plates together. A single piece of wood would have been cool, but its a lot more expensive and then I wouldn’t have had the nice wood grain symmetry that I got from joining two pieces together. To start I planed the edges of the plates to get a tight seam using the simple set up shown below with the back plates, which was sort of like the shooting board recommended by Natelson and Cumpiano in their book. It worked well for me once I got the right depth set on the hand planer, I started out trying to take off way to much material but I eventually found that setting the blade really low worked a lot better for me. I also took Natelson and Cumpiano’s suggestion of holding the two plates together in front of a light source (window, light bulb, etc.) to reveal places where the seam wasn’t perfectly tight. To glue the plates together I again took Natelson and Cumpiano’s suggestion as shown below. Basically the plates lay in between two boards that are secured to the workbench with enough gap for a couple shims as shown (with a strip of newspaper underneath the seam to keep them from gluing to the table). 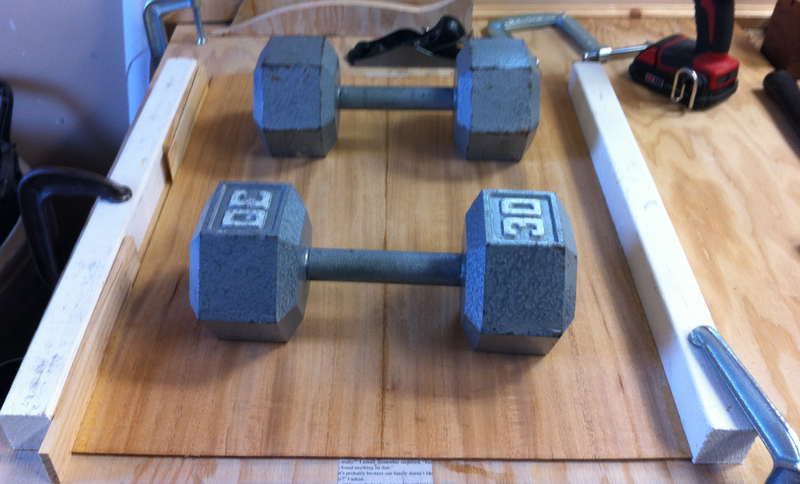 The shims were then wedged together and some weights were laid on the boards to keep them flat on the table. I found the whole process to be an easy way of applying pressure to the seam while the glue dried. After gluing the plates together the next step I tackled (or attempted to) was the sound hole rosette. I want Koa for my guitar. both for front, back and sides, but koa is not cheap. 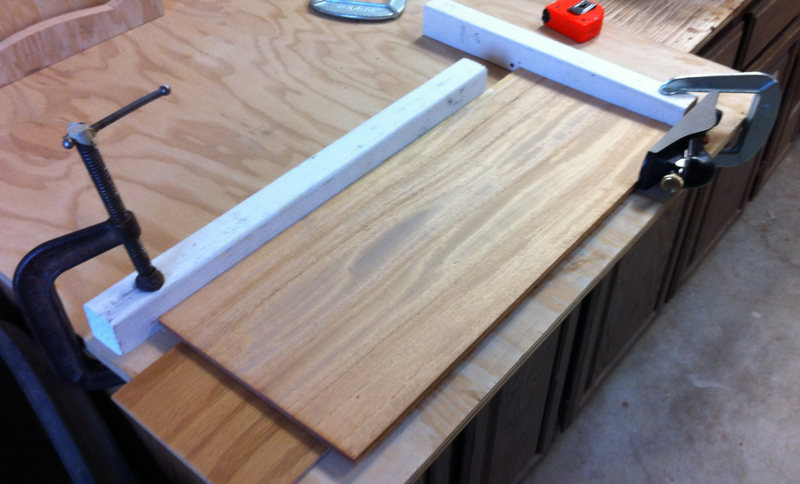 Can i for example buy a piece of koa which is 50″x5″x7/8″ and the cut the parts out? I don’t see why you couldn’t at least try it out, maybe you could use a band saw to make a few thinner sheets out of the 7/8″ thickness and then use some kind of a thickness planer to get them smooth and to uniform thickness?